Sooner or later, we all start going grey, and for many of us it'll be sooner than we're ready for. You may simply pull out those first few grey hairs, but at some point there will be too many, and removing them will not be good for the health of your hair in the long term. How can you effectively conceal them whilst keeping your hair looking natural? The simplest way to hide grey hair is to dye all of your hair. This in itself can give away the fact that you're greying however, and because grey hairs absorb dye differently, they may still stand out. If you do decide to use this approach, test it on small areas of grey and other hair first to see how it looks. Because grey hair often occurs in streaks rather than being evenly distributed across the scalp, one way to conceal it is to use streaking - the same approach used to highlight hair. This can be done in a salon or at home with a streaking brush. When choosing dye to streak across grey hair, select a shade one darker than the colour of the rest of your hair. This approach should help to make your hair colour look even after streaking. If you have pale grey or white hair that refuses to absorb dye at all, use a highlighting kit to lightly bleach it before applying dye. It may sound odd to bleach pale hair, but this will give it a rough texture that the dye can cling onto. For quick and easy concealment of grey hair there are many aerosol products available. As these are specially designed for grey hair you should choose a shade that matches your hair colour as closely as possible. 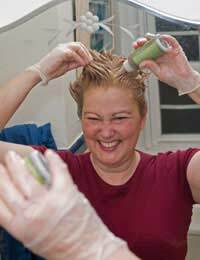 Spray-on treatments for grey hair use different kinds of pigment from wash-in dyes. These are usually based on lead acetate or bismuth citrate; they stick to the hair with very little fuss but, like the lead paint used in old houses, they are toxic (bismuth citrate less so) and you should avoid getting them in your eyes, your mouth or open wounds (such as recent shaving cuts). Spray-on treatments are easy to apply first thing in the morning as you get ready for work, but they do need a few minutes to dry, so don't push your fingers through your hair or put on a hat or scarf until they've had time to do so. If you use a comb to smooth the treatment through your hair, wash the comb immediately afterwards to prevent it getting clogged up. If only the roots of your hair are grey, or if you want to hide your grey roots in between dyeing, you can buy special touch-up sticks with which to paint them, much like concealer cosmetics for the skin. It's also possible to use mascara if you can find the right shade, or to use other kinds of make-up such as eyebrow pencils. The dyes used in touch-up sticks, because they are painted on, are less secure than other forms of dye and will come out when you wash your hair - so be careful in the rain, too! They are very easy to use, however, and are usually ton-toxic. They're ideal for dealing with the small patches of visible grey roots you may spot when you're in a rush. Eventually, your hair is likely to turn grey no matter what you do. You then have two choices - to keep on dyeing your hair for the rest of your life, or to let the grey show. Most people choose the latter, but it can still be difficult to make the transition, because suddenly revealing your grey hair can inspire people to make a fuss that you really don't want. One approach is to gradually lighten your hair with bleach or dye so that it becomes closer in shade to the grey. This means that when you do let the grey show it won't be so striking, and the effect will be one of graceful transition.